I was honored to be invited to participate in Art + Coffee for Autism charity event that will include a bunch of artists that I am huge fans of (Patrick Ballesteros, Jake Parker, and Nolan Lee, just to name a few). I will be unable to make it, since it's midweek on a work night, but I will have one original in the show, an ink piece titled "Summer Fun". I can't wait to see photos of the event! Anyone who happens to be in the San Deigo area next Thursday should go check it out! My friend Melanie Fishman hosts a wonderful creativity blog and she recently asked me to write a post about the nursery art I create for friends and family. If you don't like puns, turn back now. If you do, enjoy? Sidenote: his name is Nork and not Knork, because I was trying to remember what the weird knife/fork thing that I saw many months ago was and what I remembered did not match with the reality of a Knork. I stuck with the bizarre creation in my brain, thus he is Nork. The SCBWI summer conference flew by last weekend. It was incredible! The first year that I went, I made so many incredible friends and I loved all the talks that I went to. The second year that I went, I got to hang out with friends and make new ones, but as a whole I only liked the talks. The third year--this year--was INCREDIBLE! One after another, all the keynote speakers knocked it out of the park and left me wanting more. Mem Fox, oh how I could listen to her for hours! I love reading and I love picture books, but she has this love for words that makes me want--even a smidgen more eloquence to my vocabulary, and she definitely puts rhythm and page turn in a whole new light. Dan Santat and Molly Idle were incredible in so many ways, which I knew going in since I obsessively read what interviews and blogs I can about them. But it was even more interesting to uncover how clearly their picturebooks reflect THEM more than anything and how their lives influence their stories on so many layers from ideation to character design to workflow. Shannon Hale was delightfully witty and still heart-wrenchingly honest when she provided her insights on feminism in unexpected ways, including turning it onto it's head when she reflected how pigeon-holing something as "for girls" leads to "exclusion of boys." Varian Johnson and Kwame Alexander know how to spin a phrase. I repeat the word I used for Mem: eloquence. Incredible eloquence and motivational speaking. Kwame knows how to read an audience and play off all the speakers who came before him. Adam Rex. He liked my pig. 'nuff said. The portfolio review was lots of fun, particularly when Molly Ruttan, one of my illustration friends, won one of the mentorships and Corinna Luyken, won an Honor award! So happy for them both! I was proud of what I had accomplished this year, and I was happy with my personal growth even though I KNEW that my portfolio was not ready to win awards. It'll get there, slow and steady. and with a whole lot more STORY. I've been experimenting with block printing this fall by taking some open studio workshops at Valley Print Studio. So far, I have found that I'm loving block printing quite a bit, which is not surprising considering it's both graphic design AND illustration. The best thing it has been teaching me is how to work with errors and "imperfections", because there is no CTRL-Z when you are carving. I've done 4 block prints so far, but I only have taken 2 of them further and started playing with digitally coloring the prints. I've posted them to a new gallery on my portfolio page, since I definitely want to do more prints. And I also plan on exploring ways to incorporate printmaking into a mixed media illustration process to create more complex pieces in the future. Open Studios in Pasedena this weekend. These two titles are paired together for me because while they differ in look and feel, the rich, textural artwork of these picture books deal with water and the fluid expression thereof. Also, there's an abundance of Alison! Book: Me and My Mom! This book was recommended to me by one of the very helpful people at Mrs. Figs' Bookworm. It instantly appealed to me because of the art: very sweet, textural, and fluffy! Every page makes you wish you were there, running your hands in the soft fur of these two bears. The art is both ethereal and luminous, with a graceful dance across the pages, just as the lyrical words flow across the tongue. The mother bear glides gracefully through the water in my favorite spread, while the little bear follows with an adorable awkwardness. This is definitely a good choice for a slightly belated Mother's Day book. Soft colors and light make this perfect page. The moment I saw this book, I loved it. From the typography to the imagery to the story, this hits all the right notes for me. Graphic textures, white space, a cute puppy sidekick, exploratory adventures. It's ALL good. The perfect pages do not come in the form of a double page spread this time, but two images that mirror each other both in their similarities--boat, water, two characters--and differences: light vs dark, struggle vs solution, looking back vs looking forward. These two pages excel at the key elements of a good picture book: pacing and emotional connection. Taeeun's artwork is breathtaking throughout the entire book both for it's detail and it's restraint. The nice copyright/colophon page at the end of the book reveals the typeface (Century Gothic) as well as the art technique: linocuts manipulated digitally. Yet again, I have a strong desire to take a print-making class. This book was picked up at my recent trip to the bookstore, where I--naturally--walked out with more books then I was supposed to buy. The beautifully lush cover with the spot gloss treatment immediately caught my eye and there was something appealing about the interplay between paint, drawing, and mixed media collage that I couldn't resist. Throughout the book there are many interesting uses of the collage element that can captivate the eye through many readings: math equations, bits of graph paper, postal odds and ends, and to greatest effect, the barely visible maps that reinforce location and story. Lindsay's quirky color palette is evident in the spread below and she uses the balloons throughout the story as a playful and whimsical counterpoint to whites and blues. These balloons graphically dance across the pages while providing a surprisingly buoyant anchor-point until we reach the cusp of the story. When the balloons disappear from the pages, we know we have been transported into a new world full of different and just as colorful surprises. The biggest delight for me was when I looked through the sketchbook on Lindsay's website and discovered the picture book dummy for the book, which made me realize that I missed a crucial part of the book on first read: a double gatefold that reveals a most magical spread! But I can't tell you what is on the spread. You'll just have to open the book and discover it for yourself. DesignerCon starts tomorrow! If you're in the Pasedena neighborhood, come check it out. Tickets are $5/day, presale, or $7/day at the door. Stop by my booth and say hi! Just in time for the show, I've added new art to my illustration gallery: Sad Menagerie, Frolicking Foxes, and The Visitor . I will have prints of all three of these pieces at the show. I'm in the middle of a complex illustration, but I took a brief time-out to create a quick piece of art for my coworker's baby shower. I started with the peacock, having fun trying out different textures on the various feather types. But he looked like he needed a friend. Mr. 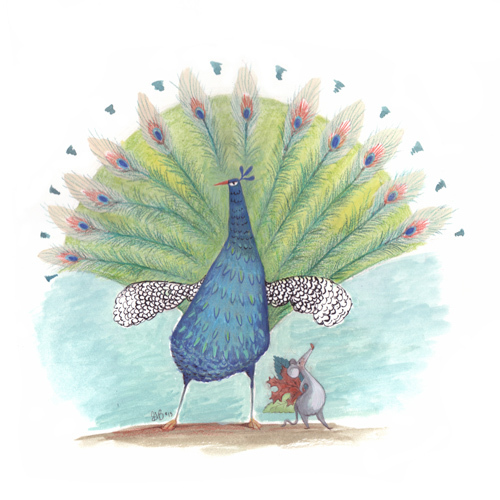 Mouse lightly mocks the peacock with the help of a few handy leaves. Mr. Peacock is not amused--but I am. I have been absent from my website/social media for the majority of this month. That's because I'm trying to focus on updates to my portfolio as much as possible right now, in preparation for the SCBWI Summer Conference. I was lucky enough to win a portfolio review from art director Giuseppe Castellano at the end of May. He had some really useful things to say regarding my portfolio, all of which I agreed with but which also put me in a state of an emotional roller coaster. Some of the many thoughts that went through my head at the start of the month included, "He likes my character designs! ", "I have a lot of work ahead! ", "Why did I put THAT into my portfolio? ", "I'll show him! ", "He's totally right, what was I doing there?! ", "Two months before the conference is not enough time! ", "EEEEK!" After panicking...then panicking again, I took a step back to try and break my portfolio update down into manageable chunks and take them one step at a time. Some of the improvements that were requested included more work, children/people, more complex illustrations, and more attention to surface textures. One of the most important things I felt he mentioned was the lack of STORY in my pieces. I have lots of cute animals, but they just sit there, staring at you. What are they doing? Why are doing it? How do people become emotionally involved in my characters? I kept thinking of Pascal Campion's work, which always triggers an emotional response and always tells some kind of story, no matter how simple or how complex the illustration. I know my strengths lie with fun and silly characters, so I chose this as my starting point for the overhaul. I have a number of stories that are in my head and in my sketchbook, but nothing felt right yet. I tried a series of fox images and kept reworking them to the point that friends commented, "STILL working on foxes?" I still like the foxes, but I got their point. I put them aside. 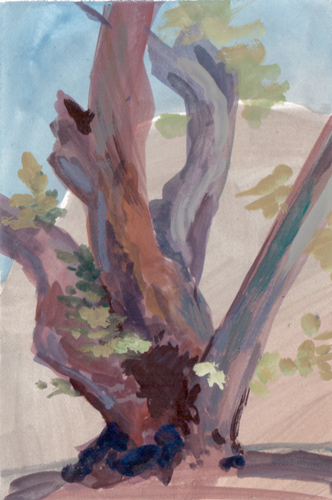 I kept coming back to a giraffe piece that I did, which I always loved the drawing, but I felt the painting was both overworked and underdeveloped at the same time. The character is spot-on but there is no background, he's weirdly fuzzy in a bad way, and I don't know what i was thinking with the placement of the shadows and highlights on the lower right. I created a story for him, I gave him a makeover, friends, and a setting. Humorous things will happen; antics will ensue. I've been sketching furiously, working out compositions and character placement so the scenes can work alone and flow with one another. At this point I have 5 pieces in various stages from preliminary sketches to full compositions with tonal values roughed in. I have a month until the conference and plan to be working hard the whole month. 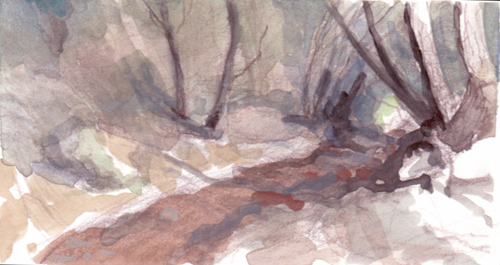 5 pieces = portfolio overhaul, but I want to be sure that the pieces are quality and not rushed. If they are not ready for this conference, I will be ok with that, because I want to give the story the time it deserves. It's worth it. 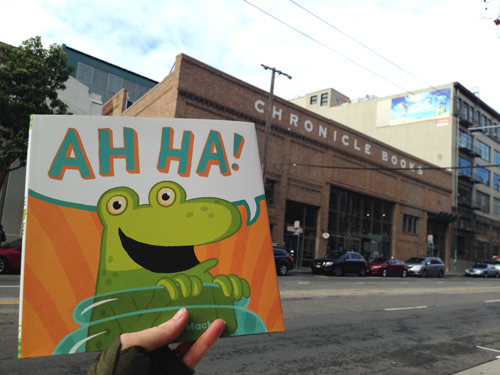 I found this charming book earlier this year at a bookstore in Santa Cruz. The quirky simplicity of the illustrations and the page layout throughout the book is what appealed to me. That, and the giraffe. 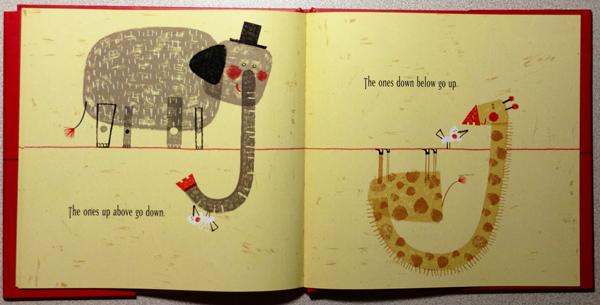 So naturally, the perfect pages in the book for me were when I found the giraffe again and realized he was paired with an elephant! What could be better? This book uses the concept of two "worlds" to show diversity--the above world and the below world. While the worlds dynamically mirror each other, they are still each unique and different--as unique and different as a giraffe and elephant. Even the placement of the typography is a mirror in a way, with text falling both above and below the central line. Rich in texture, rich in story, rich in simplicity--this is a fun read. I had a very busy week immediately following the comic expo, so I'm just now getting to my recap of the event. In short, it was GREAT! no holders for the business cards, because people just knocked them over anyway. making sure I have prints of any original art I brought with me. I had prints of one, but not of another that people were particularly interested in. pen and paper signup sheet for my newsletter. I had QR codes, but not many people seemed interested in them. rearranging things on the table so I wasn't blocking my view of the traffic as much. having prints and buttons. People who did respond to my work responded very well AND wished I had more. Prints and buttons did the best for me. having original art that was on my table instead of behind me...AND putting an impromptu spotlight on the piece with a mini flashlight. So many people stopped to get a look at the art because the lighting made the focal point glow. doing quick sketches, once I got comfortable drawing in front of people. my first couple of sketches were a bit shaky and hesitant, but then I got into the flow of things and it got easier as the day progressed. To everyone who stopped to talk to me, thank you! I wrote down all your requests for different animals and they will appear sooner or later in my art. Next stop: SCBWI Summer Conference and entering the portfolio showcase! Time to polish my portfolio. Me at my table. On the white crate sat an ipad with a rotating portfolio of my work. The start of the sketches I worked on throughout the day. Once I started drawing the fox, I got people really excited about my sketches and I drew many more animals. These are all drawn on MDF squares that were very fun to work on. Finished fox sketch that went to a new home. Jellyfish sketch that went to a new home. The child who received this had a big smile and his father thought he was more excited about this than the toy they also bought him that day. That was definitely the highlight of the day for me. dog that went to a new home. fox that went to a new home. tiger that went to a new home. A life-sized, working, robotic Wall-e. Definitely my favorite character of the day, although there were some great costumes there. I am not a writer. But that doesn't mean I don't have stories to tell. I think visually and oftentimes what helps me the most in drawing my characters is thinking up a story for them. I have one bad habit, though: I have a tendency to keep adding more and more characters until the next thing I know is that I'm overwhelmed by everything and don't know where to start. Then the project gets put on hold. And lingers, unfinished. I decided to create a story based on a single word: "hi." I wanted this word to be expressive, showing a range of emotion and to allow me to use my love of typography as part of the illustration as well as the writing. I wrote no other words--writing is scary. Instead I created a character who was created by me being silly: While driving mountain passes with my husband we would often pass people bicycling. I would point them out to my husband, but "bicyclists" does not roll off the tongue smoothly. "Basilisk" flows a bit smoother. I kept saying it. "Bicyclists, basilisk." Without realizing it, I had created my character. I sat down and started to draw, giving myself a hard deadline for completion. After a bit of a piecemeal process of creating these characters, I digitally composited them into a comic format, creating my very first finished story. Its a little clunky, it needs some help, and maybe some more details, but it's more than I had a month ago. Later this week, a good friend who has worked in animation is going to help me pick apart this comic and offer suggestions for ways to turn this into a better story. A 10-minute talk already helped me think about things with a new light. Not everyone knows mythological characters as well as I apparently do, so I may need to add additional textual queues. But that won't be writing, that will be editing. After all, writing is scary. Things will change. I'm sure I will get frustrated along the way and want to give up. But I see potential, if I take it slowly. It will be just like designing a book cover: set up comps, elicit feedback, revise, put it away for a bit, come back to it, scratch plan A and go to plan B, elicit feedback, revise until it's final. I can do that.